High profile sponsors of for this year’s prestigious Birmingham Young Professional of the Year Awards 2016 – BYPY 2016 – have been revealed. Each year the awards – run by leading membership network BPS Birmingham Future – recognise the stars of the city’s business and professional services in the sectors: finance; legal; HR; recruitment and training; technology; property and construction; and marketing and communications. An overall BYPY winner will be chosen from these six winners and will benefit from a range of professional development opportunities, including a place on the Common Purpose Navigator course, designed for emerging leaders. The BYPY also crowns an Inspiring Leader, which recognises exemplary figures within the professional community whose effect can be measured by their impact on others, and an Aspiring Talent Award, which sees a passionate and dedicated 16 to 24 year-old in full time higher/ further education or training celebrated. With nominations closed and just two months to go until the award ceremony, at the ICC on May 12, here are the firms who are backing this year’s event. Mike Bandar with Jodie and Ben Cook at the launch of the Birmingham Young Professional of the Year Awards 2016, at Hotel La Tour. Headline sponsorship has snapped up by Santander UK. The bank, which employs over 25,000 people across the UK, including its offices on Livery Street in Birmingham city centre, focuses on supporting and developing employees. It prides itself on providing excellent opportunities for career progression and having a culture that recognises individual needs and encourages accountability and teamwork. The global IT services provider which specialises in all areas of business IT and has been based in Birmingham for more than 40 years, will sponsor the Technology category. Alex Paul, Sarah Tuohy and Mark O&apos;Donnell at the launch of the Birmingham Young Professional of the Year Awards 2016, at Hotel La Tour. Another Birmingham-based independent business, is sponsoring the Finance category. Returning to BYPY to sponsor the Property and Construction category. Also returning to BYPY and will sponsor HR Recruitment and Training for the third year running. 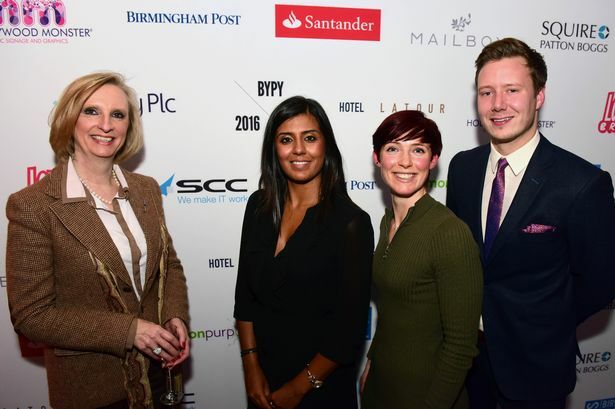 Emily Rose, Rory Whitmore, Jaspreet Dhadad and Ravi Kotecha at the launch of the Birmingham Young Professional of the Year Awards 2016, at Hotel La Tour. Worked with the BYPY committee last year, the complex and has signed up to sponsor the Legal category. The law firm which has operated from Birmingham for more than 100 years, is sponsoring the Inspiring Leader Award for a second year. Sponsoring the Aspiring Talent Award. Sponsors of the Market and Communications category are due to be announced in the coming weeks.